As you pack for a road trip, water may not be at the top of the list. 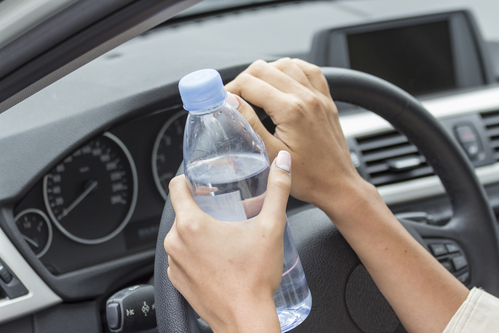 Most drivers don’t consider the importance of staying hydrated while they’re on the road. However, it is extremely important for a safe trip. Learn more about this below and pick up some water along with your other essentials at Tri-Mart BP, a local convenience store in Tripoli, WI. Drivers may try not to drink water, thinking they’re benefiting by avoiding extra bathroom breaks or staying alert with only caffeinated beverages. The cost of dehydration, however, far outweighs these other concerns. According to the Mayo Clinic, dehydration can quickly lead to dangerous problems such as fatigue, dizziness, and confusion. It can also dry out the eyes, leading to double or blurred vision. Drifting off for a moment or feeling dizzy for a few seconds is all it takes to get into a serious accident. Before you head out, stop by your local convenience store and pick up a cooler with plenty of water bottles and ice. Cold water will help regulate your body temperature as the hot sun comes through the windshield and will help keep you alert. If you want to take a coffee or energy drink, that can help, too, but be sure to drink twice as much water as you do any other beverage so the sugars don’t dehydrate you. Give yourself some extra time to get to your destination. Chances are you’ll require some extra bathroom stops, but it’s well worth it, and your family will appreciate the opportunities to stretch their legs. No matter what you need for your journey, Tri-Mart BP has everything you require. Their gas station is open 24/7 and has both diesel and unleaded options. Their full-service convenience store has an excellent selection of refreshing water and coffee to keep you alert and hydrated on your journey. Stop by their store to stock up, or call them at (715) 564-2440 for more information.